Man of the match Forrest scored in a 3-0 Hampden win over Aberdeen to help provide Rodgers with his first trophy as a manager. It was Celtic's third victory over the Dons this season and further evidence of the improvement Rodgers has secured since replacing Ronny Deila in the summer. Aberdeen defeated Celtic twice last season to maintain a title challenge until April, but they were well beaten at Hampden as the champions recorded their eighth consecutive domestic clean sheet. All the boys repaid him with the trophy and hopefully we can continue to do that." The Scotland winger is possibly the best example of the influence Rodgers has had on individuals. The 25-year-old was latterly a peripheral figure under Deila, who signalled that the wide player was going to move on when his contract expired in December. But Forrest regained his place in the team under Rodgers and soon signed an extended deal, and put in one of his most memorable displays in a Celtic jersey against Aberdeen. He drifted inside to find space and hurt the Dons on numerous occasions, notably when he ran at the defence and fired just inside the post to put Celtic 2-0 up. He later won the penalty which Moussa Dembele converted to round off the scoring. And Forrest admitted he had been rejuvenated by Rodgers. "He has just been so positive and hopefully we can keep going and win more. Hopefully this can kick-start us winning more trophies." 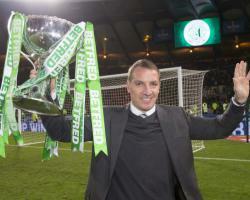 The triumph proved Celtic's 100th major trophy and Forrest was delighted to be part of history. "It's tremendous, that's why you play football, for days like this," he said. It's been a great start for the full team and we are just buzzing to get this trophy in the bag early doors."